Nohemi Perez, co-owner of Ed’s Cheesesteak, packed this BLT in a GO Box for Paul Liotsakis, who launched GO Box in the Bay Area. Ed’s Cheesesteak is a GO Box vendor and also serves as Oakland’s wash site for the boxes. Paul Liotsakis says he’s once again “on the bleeding edge” of a new concept. The 48-year-old Alamedan joined the organic food industry before standards were set and worked as an installer of solar and wind energy systems before there were permitting laws. Now Liotsakis is championing the GO Box, a reusable alternative to take-out food containers. GO Box is a modern take on the old-fashioned lunch box—the kind you brought to school every day after a thorough washing at home. The durable, reusable, BPA-free plastic containers for hot or cold food come in two sizes. They snap shut to prevent leakage and are easy to carry. GO Box works via an app. After ordering food at a participating local eatery, the customer uses the app to request that their take-out meal should be packed in the box. After the meal, the customer returns the used box at a nearby drop site, where it’s picked up, sanitized in a commercial kitchen, and delivered back to the same (or another) participating eatery. A yearly GO Box subscription costs $24.95. For a test run, I met up with Liotsakis at Ed’s Cheesesteak in Oakland’s Frank Ogawa Plaza, where we ordered a BLT to go. Then, using the GO Box app, we entered the restaurant’s code, authorizing Ed’s Cheesesteak to pack the sandwich in a GO Box. After eating, we walked across the Plaza to the GO Box collection bin inside Oakland’s City Hall, where we used the app again to scan the code posted on the bin, showing that our GO Box had been returned. Wish-cycling: The practice of tossing questionable items in a recycling bin (or in the wrong bin), hoping they can somehow be recycled. The best idea Liotsakis had heard about came from a woman named Laura Weiss, who lived and worked in Portland, Oregon, where there’s a concentrated lunch-cart business. (Unlike food trucks, the carts stay in one place.) Before starting GO Box, Weiss was bringing a container from home to the lunch carts, although she realized this was technically against health department rules. In 2011, drawing on her background in sustainable business, Weiss launched GO Box, which today boasts more than 70 Portland food vendors and 3,500 subscribers. All pick-ups and deliveries of the boxes happen by bicycle. Liotsakis went to Portland to meet Weiss, and in 2014 signed an agreement making the San Francisco Bay Area the first new location with a GO Box license. The package includes marketing, branding, mobile app, and advising. In June 2018, Weiss sold GO Box to Jocelyn Gaudi Quarrell, who brought to the concept expertise in marketing and a background in bike sharing. “The modern world has been designed with hyper-convenience in mind,” says Quarrell, “but it’s time we rethought the impact of that convenience.” She is working to expand GO Box by licensing additional cities across the United States. Since getting the Bay Area license, Liotsakis has launched GO Box pilot projects in Oakland, San Rafael, and Palo Alto. 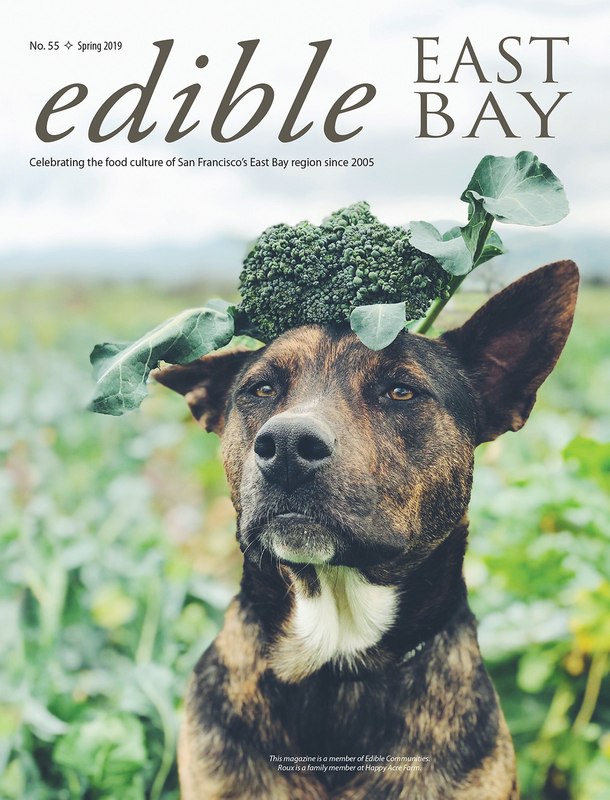 Eight eateries around City Hall and the 12th Street BART station took part starting in 2015, and about 30 individuals purchased subscriptions. To make the finances work, Liotsakis started pitching it to local corporations, asking them to provide a GO Box drop-off site in their lobbies and offer subscriptions to their employees. Liotsakis also received a small grant from StopWaste.org, but it wasn’t enough to pursue an ongoing strategy to recruit companies and individuals for the program. He ran into a setback in January of 2018, when GO Box had to suspend services in Oakland as Max’s Diner & Bar, the wash site for the Oakland boxes, closed down. Isn’t it Enough to Compost and Recycle? What’s the problem with simply recycling and composting? Here’s a recent example. Recycling in the United States hit a roadblock in January 2018 when China stopped recycling foreign paper and plastic. According to NPR’s Planet Money, China had previously recycled about half the world’s paper and plastic products. Without that market, paper waste took on a negative value, meaning that recyclers have been forced to either pay other countries to recycle their paper or choose the more expensive option of putting it in a landfill. In addition to financial hurdles, the sorting process is imperfect. Small or unusually shaped items (like plastic utensils and straws) typically don’t get recycled because sorting machines can’t handle them. And consumers don’t always know whether their take-out cup or container is recyclable, compostable, or trash. Some people incorrectly assume that “biodegradable” and “compostable” are the same, but biodegradable items don’t always meet the standards for composting and may take decades or longer to break down. Major corporations are slowly responding. In August 2018, Starbucks and McDonald’s announced that they’re collaborating to develop a paper cup with a plant-based biodegradable liner—the goal is a cup that could be more easily composted and/or recycled. Starbucks also announced that it will stop using plastic straws in its stores worldwide by 2020, replacing them with a lid or straws made from alternative materials. One controversial aspect to this decision is the importance of plastic straws for people with certain types of disabilities; the question of how to ensure that such needs are met is not yet resolved. Here’s an obvious question: Why not just sip our coffee from reusable mugs? It’s something that’s happening with increasingly frequency in Germany. According to reporting on Public Radio International’s The World, the Munich-based startup RECUP offers a reusable coffee cup service. Customers pay a one-euro deposit per cup and return the vessel to any of about 1,000 cafes to get the deposit back. The idea came from German beer culture, where it’s common practice at retail stores, festivals, and biergartens for customers to pay a refundable deposit for their bottle or glass. Closer to home, Oregon Public Broadcasting reports that seven of Oregon’s craft breweries are now offering beer in refillable glass bottles, with some cider and wine companies interested as well. Developed by the Oregon Beverage Recycling Cooperative, the bottles are thicker and heavier than a typical beer bottle and can be reused 40 to 50 times. 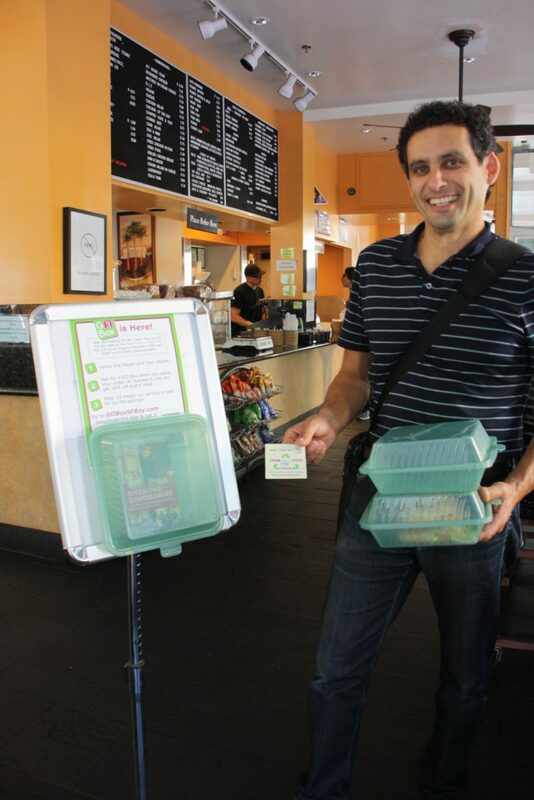 Paul Liotsakis checks out the GO Box display at the Rotisserie Deli in Oakland’s Frank Ogawa Plaza, where managers Kenny and Elaine Taing were early supporters of GO Box. Back in Oakland, Liotsakis was able to restart GO Box when Ed’s Cheesesteak signed on in August 2018 as Oakland’s new wash site. Owners Nohemi and Raul Perez also own the Juice Joint Eatery, just a few steps away and also a GO Box vendor. Nohemi says she views reuse as the right thing to do and a system in which everyone can help a little bit. It seems natural to her, since she recalls it as common practice from her time growing up in Mexico to bring your empty Coke bottle back to the store. As a restaurant owner, she says, an added benefit is that GO Box customers often don’t request a bag because the box is so sturdy and easy to carry. GO Box vendors in Oakland also include the Rotisserie Deli, Café Talavera, 475 Café, Fountain Café, Tia Maria, and CORE Kitchen. At the time this story went to press, Liotsakis had reached out to the City of Oakland about collaborating on GO Box education and outreach, but the city had yet to make any commitments. Senior recycling specialist Wanda Redic says Oakland is supportive of reuse over disposal. “It’s my hope that we will one day change the conversation from disposal to reuse as the default option,” she adds. Just a few miles away, the City of Berkeley’s Zero Waste Commission recently finished a set of public meetings on Berkeley’s Disposable Foodware and Litter Reduction Ordinance. The proposed legislation requires that eateries provide reusable foodware for dining in and compostable foodware for takeout. As a next step, the Commission will send its recommendations back to the full City Council.